Colorful impatiens flowers nod over your garden during the summer month, exhibiting the quirky habit of tossing out a seed if you touch them. Impatiens are a garden flower with a range of varieties. 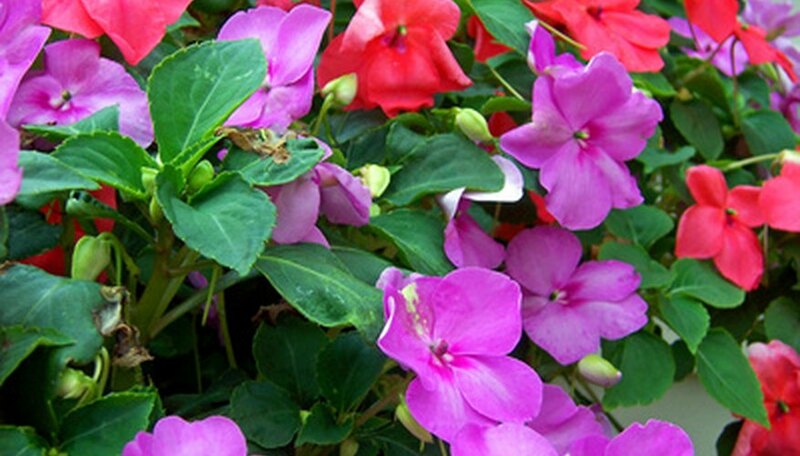 A closer look at how the impatiens flower is classified reveals the connections the varieties share. The system of plant classification used today classifies plants based on how they are related to each other, relying on multiple bits of information to do so. Organisms sharing higher levels of classification are not necessarily closely related and may share few features in common. As you proceed into the lower levels of classification, organisms are more closely related and, as a result, often closely resemble each other, until you end with a species, a group of organisms closely related enough to reproduce together and produce fertile offspring. Classifying the impatiens flower requires beginning at the top of the classification system and moving downward until you end up with a species. Flowering plants are further divided according to their structure inside of the seed. Impatiens flowers belong to the dicotyledon, or dicot, class, meaning that the embryonic plant has two primitive leaves called cotyledons that serve primarily to nourish the growing young plant, according to retired biology professor John W. Kimball of online resource Kimball's Biology Pages. Dicots share other traits in common, observable in the impatiens flower. The veins in their leaves assume a branching or netted shape, and flower petals occur in multiples of four or five. The impatiens flower has five petals, a trait of this class. Impatiens belong to the Balsaminaceae or touch-me-not family. There are more than 900 species of touch-me-nots found around the world, though most are native to tropical regions of Africa, according to the Pacific Bulb Society. Touch-me-nots tend to have fleshy leaves and five petals, but what truly distinguishes them and earns them their name is their habit of forcefully expelling seeds whenever touched. Within the touch-me-not family are two further subdivisions, or genera. One genus, Hydrocera, contains only a single species. All other touch-me-nots belong to the Impatiens genus, meaning that there are over 900 species of impatiens flowers found throughout the world. This diversity accounts for the variety of colors, sizes and forms of impatiens flowers, several of which are cultivated as ornamental garden plants. USDA Plants Database: Impatiens L.